2) But in interviews at P.S. 45 and other schools [...] principals, parents, superintendents, teachers and students offered this most basic explanation: They worked hard. 3) But even with this year's unprecedented increases, only half the city's students were proficient in reading and math. The NYT article came with a simple chart, shown on the left together with my junkchart version. What did I change? 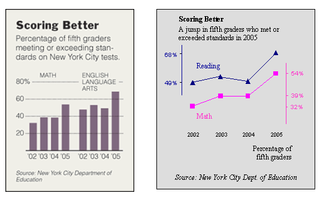 The use of vertical bars obscures the main point of the chart, which is to show the jump in test scores from 2004-2005. Switching to a line chart remedies that. Foregoing the full vertical scale, I only included the relevant percentages, which again highlights the jump in scores. Tufte calls the excessive use of grid-lines "chartjunk". Labeling the second series "Reading" instead of the cryptic "English Language Arts" brings it in alignment with the text. Using lines also allows me to stack the math and reading data on top of each other, making clear that students have always scored better on reading than on math. 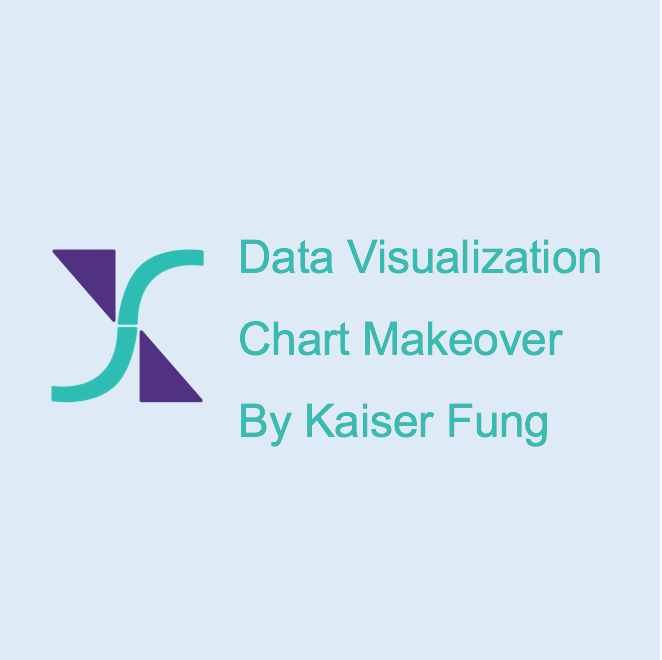 The new subtitle tells the reader how to read the chart, instead of a wordy description of the nature of the data. Another possibility is to plot the change in percentages from year to year, instead of the absolute percentages, which would serve the main point best. However, when differences are used, some data are lost, specifically the absolute percentages meeting or exceeding standards. Reference: "What Lifted Fifth-Grade Scores? Schools Say Lots of Hard Work", New York Times, 6/12/2005.